Ground coffee, an iMac, and a flash of inspiration: essential tools for many a blogger. Blog image by RawPixel.com/Shutterstock. O.K., forget the above list, we know there’s nothing better than blowing our own trumpet every now and again. The whole point of our blog post title is the way it was constructed. Whereas all our blog titles are beautifully crafted, this one was created with a blog title generator. Yes, we at Net66 cheated a little by using a title generator. Oh, the shame. Why leave your blog titles to chance? Well, seriously, there comes a time when you cannot think of a suitable blog title or blog post. You may have exhausted any possible how-to-guide, listicle or pictorial post idea known to man. Fear not, here’s our fistful of blog title generators. For our generated title, we turned to TweakYourBiz.com. You are presented with a search box where you enter a given subject (for example, ‘the Net66 blog’, which we chose). You can decide whether the term is a noun or a verb. Moreover, you are given three options for your results: Title Case, Sentence case, or ALL CAPS. On entering your search term, you are presented with a number of possible titles. Shhhh… Listen! Do You Hear The Sound Of The Net66 Blog? The Net66 Blog May Not Exist! Tweak Your Biz’s generator is probably the most comprehensive title generator we have tried. 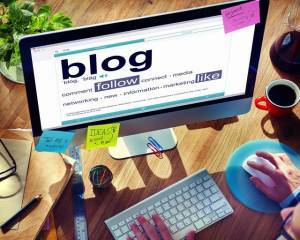 Its wealth of potential blog posts offers great scope. How to Make Manchester as Fierce as RuPaul. Portent’s page lacks the sensory overload of Tweak Your Biz’s page with a friendly chalkboard style. It has helpful annotations of the title, detailing the How, Where, What and Why of each element. After entering a search term, SEOPressor returns five suggested titles. If you are not too impressed with the first five, you can click the refresh button and hope the other five are a better fit. It is also a landing page, which refers to a downloadable eBook. Though the three sites are good for suggesting blog titles, we recommend using title generators sparingly. Effective they may be, there is always room for originality, whilst making sure the title works with humans and search engines. Once you’ve sussed out how to structure the titles along their lines, you can bend the rules a little whilst faithful to proven title structures. There’s probably more people than you think who would like to read What Donald Trump Can Teach You About The Net66 Blog, given the timing of the U.S Election campaigns. It is worth noting the similarity of the titles, which are claimed to enhance engagement and entice readers. Like the title of our blog post, the language is structured to drive users to the article. This is what we call ‘link bait’. Each title has a ‘call to action’ which implores potential readers to read on. They might find the article fulfilling, life-changing, or that it piques their curiosity, or they roar with laughter. We hope you like this one. Does it fulfil our quintet of secret techniques or encourage you to play with SEOPressor? Feel free to comment.